... a kaleidoscope of cascading autonomous actions, media streams and screenings, workshops, discussions and happenings. ... a diversity of tactics to disrupt the present and create the future.
.: an event to dismantle the enclosures :.
.: not an organisation to create more :. » For an archive of desert.indymedia materials (stories, pictures, soundfiles ... ) and more, go to melbourne.indymedia. This site is now a partial archive of that event, and was the work of a small handful of people who worked on the communications infrastructure for the Festival, including the Infodesk which acted as a point of communication rather than mediation. That infrastructure has been dissolved, but deserves special mention for making the event possible, and possible in such a way that people and groups could organise autonomously and communicate with eachother in a horizontal, crossborder way. 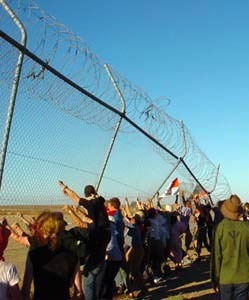 The on-ground infrastructure consisted of working groups: health, medical, transport, campsite, desert.indymedia. It was complemented by a myriad of affinity groups who made their own way to Woomera and participated in the spokescouncil. And, not least, the virtual communications infrastructure: the rideboard, the general email discussion and announcements lists, messageboards, indymedia and the Virtual People Smuggler. Many of those things were made possible by crossborder involvement - big thanks to Southspace, noborder.org, the indymedia networks, spinach, cat@lyst and all the other netnomads. The biggest thanks of all goes to those people who were and are detained in Australia's internment camps. Who, many years ago, before most locals had acknowledged the existence of those camps, launched an insurgency against the caging. And who, during Woomera2002, once again showed the importance of doing what is required by the moment and circumstance.